Strength training has been touted as an important component of physical activity for years, and a recent study is highlighting the benefits for cancer survivors as well. Survivors who engage in strength training can overcome muscle loss, a common side effect of many treatments. For prevention the research is clear – studies show that regular activity can help you get to and stay at a healthy weight, and is also associated with strengthening the immune system and lowering risk for certain cancers. Check out our tips to work strength training into your exercise routine, anytime and anywhere. Strength training can be done anytime and almost anywhere. The ideal amount of resistance training isn’t usually measured in minutes, it’s measured by the number of exercises and repetitions completed. You should strive to complete 8 to 10 different exercises that target all major muscle groups. Aim to complete at least one set of 8 to 12 repetitions of each. Resistance exercises use resistance to challenge muscular contraction in order to increase the strength and/or endurance of a muscle. This type of training can be done effectively using either weights or resistance bands. You do not need to complete the same series of exercises using both bands and weights. But you can add variety to your routine by using bands for some exercises and weights for others. If you are new to resistance training, the exercises in this video are a great way to get started—perform these exercises two times during the first week, then consider adding one new exercise each week until you have reached 8 to 10 different exercises. 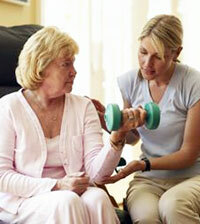 Resistance training is recommended for people of all ages; however, every individual has different health concerns. If you are new to exercise or if you have specific health issues, you should consult your health care provider before substantially increasing your physical activity. This physical activity readiness questionnaire (PAR-Q) can help you better understand your level of risk. The American Council on Exercise (ACE) says it’s best to keep challenging ourselves, first by gradually increasing the number of repetitions. Once you can comfortably do an exercise 15 times in a row, try a more challenging version of the exercise. Also key to maximizing the results of your strength training is to rest affected muscles two days between strength exercises. Watch the video for more strength-training ideas.